Your makeup runs, sweat stains your clothes, and it makes you smell less like a field of wildflowers and more like a high school locker room. Who wants to sweat? All that aside, you really should welcome those beads (or rivers) of perspiration. Of course, we’re not saying that you should celebrate the pit stains that result from delivering a nerve-wracking presentation or that you should jump for joy when you’re crammed on a subway car during rush hour in July. However, engaging in intentional sweat sessions during exercise or using heat therapy, such as in a sauna, make you happy and healthy. Sweat sessions should be celebrated! Why? Let’s check out four reasons why hitting the gym does more than build muscle and burn fat. Whether you eat a super clean diet or not, you can’t help but have toxins in your body. The air you breath, the cosmetics you use — virtually everything that is a part of your environment adds to your body’s toxic load. This isn’t to say, though, that you need to live in a bubble and shield yourself from everything potentially harmful. In fact, your body has the natural capability to handle a certain amount of toxins. Sadly, we experience an overload of harmful substances today, and you may need an extra shove to get them out of your system. One of your body’s primary means of excreting toxins is through sweat. If you’ve been feeling sluggish lately, or if you have a buildup of salt, alcohol, or cholesterol in your system, sweating is likely just what your body needs to start purging the excess. If you have hard water, you may notice that from time to time your shower head gets clogged up, and you have to clean the nozzle with a chemical to get rid of the buildup. The next time you turn on your shower, there’s a surge of water like you haven’t seen in quite some time, and you even notice that some of the buildup gets pushed out. Your pores experience buildup as well, and from time to time they need to have the gunk flushed out. Sweating is just the answer. When you sweat, you blast the clogged pores with sweat, pushing out the bacteria and other matter that has built up and caused those nasty breakouts. Not only does sweat itself contain a natural antibiotic, but when you work up a sweat, your body temperature is raised, killing pathogens that cannot survive conditions above 98.6 degrees. This is probably not news to you since you know that a fever is your body’s natural reaction to infection. However, you can take it one step further and stave off illness by raising your body temperature through exercise or with a sauna. If you have ever had the not-so-delightful experience of having kidney stones, you’ll do whatever it takes to not go through that agony again. And if you’ve never had them – well, trust me when I tell you you want to do everything in your power to prevent them. Sweating eliminates salt and, at the same time, helps you to retain calcium in your bones instead of flooding your kidneys with salt and calcium. And, if you’re sweating, you’re likely drinking more water, flushing your kidneys out. 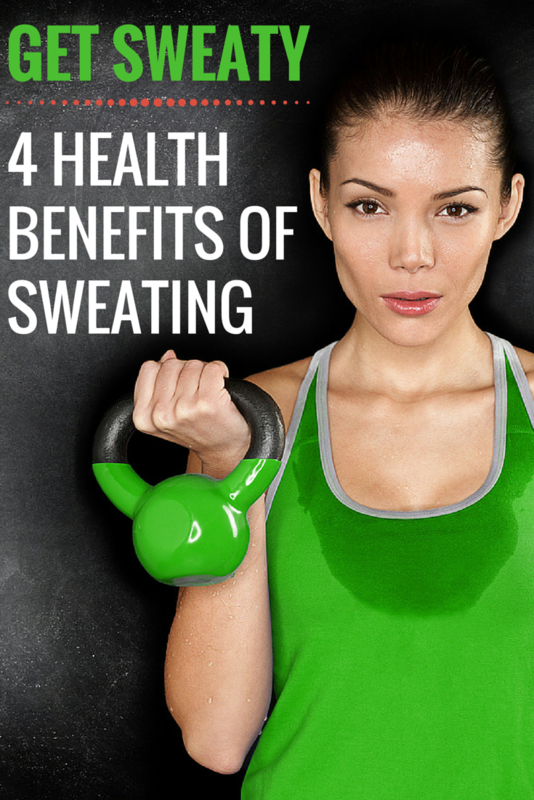 Besides the health benefits we’ve discussed, sweating helps to keep the pounds off! If you’ve been struggling to make lasting changes that lead to weight loss, there’s no need to go it alone! Our “New You” lifestyle plan will help you set realistic weekly goals to achieve the weight loss you desire. The plan builds momentum slowly so you make changes that will stick! Ready to get started?